Here lies the foundation of the secret sexuality, the void and reaching beyond good and evil. As many have sought to understand the role of the feminine in nature and magick, the key opportunity for those practitioners of the Luciferian path is to understand the druj and the feminine within first. Woman is the most important recipient and focus point of magick. Without the woman the male is ineffective, at a loss. Woman has been beat down by Christianity and other white light religions for so long that they have nearly beaten down the nature of woman. There are divine principles of which the woman is known, all are essential and merely a method of categorizing points of initiation and wisdom. Woman is essentially the Goddess incarnate. 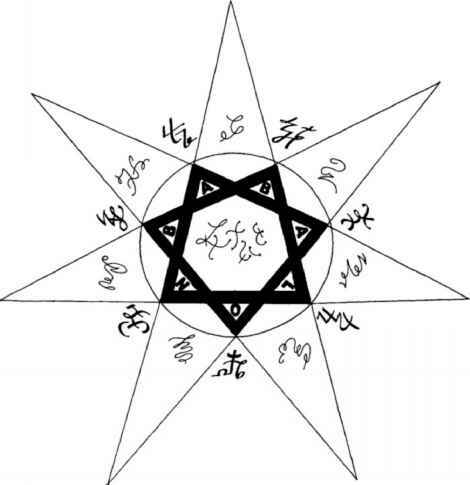 The 14 points of this sigil should be recognized as a detailed tool of understanding the Daemonic Feminine. If you are male, fortunate enough to have a woman who seeks this path, your initiation will expand at a more rapid pace than some. To those solitary magicians who lack a companion for one reason or another, your challenge is to understand. To understand you should experience. There are actually 17 or more known names of Lilith, which are essential to understanding the predatory nature of the Goddess. Do not look outside of yourself for her - look within first. Find the predatory (achieving) elements and look to Her totem animals -owls, bats, lions, wolves: how do they interact with their own species? Do they show nobility, respect? How do they interact with prey? How does instinct play a role in your initiation? If you are too structured in terms of practice, possibly closing the mind to instinct - are you really becoming? The night demoness from ancient Sumerian lore, Lilitu is the daemonic feminine at its most beautiful and intense. Understand that all that you do is driven by desire itself. How can one measure desire? You must find what you want, utilize it as a point of inspiration to accomplish your goal. If your goal is subtle, the demoness is actually divine and always of good thought. If she is your direct desire, the fire of Az may drive you mad. Control desire by productive focus, discipline. Try a sigilization method which can bring you into dreaming congress with this type of servitor or spirit. There are traditionally 17 names of the Goddess, as revealed by the Hebraic Prophet Elijah. Lilith is just as Samael, he mate. She is one half of the Adversary and the fiery aspect of consciousness and desire. What are all of the names of babalon scarlet lady?